GHOSTS OF MATEGUAS was published in early 2016 and, in 2017, was named "Finalist in Thrillers" in the Book Excellence Awards and "Finalist in Horror/Suspense" in the IAN Book of the Year Awards. in 2017, Linda published the award-winning SUMMER GIRL, and SARAH & ZOEY. Today, she is working on a new series of gothic fiction, THE KATE POMEROY MYSTERIES a horror novella. A young doctor lives a busy and satisfying life, but in an unprecedented and inexplicable turn of events, she finds herself exiled in the one place she fears the most in Storm Island (A Kate Pomeroy Mystery) by Linda Watkins. After experiencing a disturbing psychological episode while doing a medical procedure, Dr. Kate Pomeroy unwillingly retreats to her family's island estate to recuperate. Despite her childhood trauma of discovering her mother's body there, Kate's family insists she undergoes therapy with her noted psychiatrist aunt at her home. Not understanding the sudden, triggerless onset of her psychosis and not wishing to be hospitalized, Kate reluctantly agrees to the latter. Fortuitously, soon after her arrival, Kate runs into Jeremy, an old friend and a lifelong resident of the island. Their instant attraction turns into a romantic relationship, and Kate is happier than she has been in a long time. Busy with Jeremy, the symptoms of her psychosis seem to have disappeared. However, when Kate discovers a stone structure without any perceivable entrance sitting in the middle of a clearing and describes it to Jeremy, not only can he not see it, but he also denies knowledge of its existence. Now, even Jeremy, the one person who didn't doubt her sanity, has begun to wonder if Kate is delusional. With her family threatening to have her institutionalized, time is running out, and Kate must find a way to prove she is as sane as they are. But with the evidence stacked against her, how can she prove it? Is Kate losing her mind, or is there something more sinister happening behind the scenes? An intense and intriguing puzzle, Storm Island by Linda Watkins is a thrilling and suspenseful mystery novel that you can't put down once you pick it up. Complete with a complex plot, a fascinating story line, and wicked antagonists, it is a stunning story that keeps the reader enthralled until the very end. Beginning with the first chapter, it seems as if someone is behind Kate's psychotic episodes, but as the story progresses, you start to wonder if she might be delusional. Kate's ineptitude with human behavior and her slowness to question her circumstances give a realistic facet to her character that makes her relatable. Even though I thought I knew what was happening to her, I was kept guessing until the denouement. With all the psychological twists and turns, this captivating novel reminds me of a cross between a Hitchcock film and a Phyllis Whitney novel. It is an exciting tale of deceit and betrayal, with just a small hint of the paranormal, and will delight those who enjoy a good psychological thriller. Storm Island: A Kate Pomeroy Mystery is a contemporary Gothic romance novel written by Linda Watkins. Kate’s busy life as a second-year surgery resident at LA’s Memorial Hospital was abruptly ended when she began to feel dizzy in the operating room and woke up strapped to an emergency room gurney and under heavy sedation. Even her father’s position as Chief of Staff there wasn’t sufficient at first to protect her from Dr. James Conway, Assistant Chief of Psychiatry, who had taken charge of her case, was keeping her pumped full of psychogenic drugs and holding her in the Psych Unit. Conway was determined to have her committed to an asylum but Kate, her dad, and her friend, Seth, somehow managed to get her out of the Psych Unit and into the Medical Unit. Her dad had her released the next day and sent her to her Aunt Hephzibah, a psychiatrist, in New York. Then there was a change of plans. Kate would be sent on to the family retreat on Storm Island, a 1920s mansion perched on a small island off the coast of Maine. Kate had grown up loving the summers spent there with her mom until something awful had happened. Going back there now did not seem at all conducive for healing. In her contemporary Gothic romance novel, Storm Island: A Kate Pomeroy Mystery, author Linda Watkins gives the reader a strong main character to rally around and a compelling mystery to consider as Kate confronts old and new mysteries on Storm Island. Watkins’ descriptions of Storm Island had me wondering once again if winter in Maine would really be all that bad and ruefully accepting that, yes, it would be. I was still, somehow, tempted nonetheless by those marvelous descriptions of the rugged coastline and the salty presence of the Atlantic. I loved Watkins’ Mateguas Island series and was delighted to discover this new series by her. Storm Island is a real treat of a novel, filled with chills, historical mysteries and a compelling heroine. I seriously can’t remember enjoying a Gothic novel as much as I did this book, and I have always enjoyed the genre. 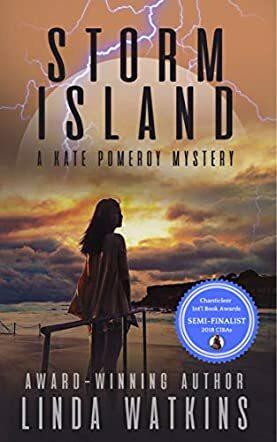 Storm Island: A Kate Pomeroy Mystery is most highly recommended. Dr. Katherine “Kate” Pomeroy, a second-year surgical resident at Los Angeles’ Memorial Hospital, suffered a “breakdown” during a surgical procedure. Her father, Dr. Ham Pomeroy, the Chief of Staff at the same hospital, sent her to Storm Island. She stayed in the carriage house of the Stormview Manor estate, owned by her psychiatrist aunt, Dr. Hephzibah Pomeroy, and her husband, Raoul Kassis. Although Kate spent many of her childhood summers on this picturesque island, those idyllic vacations ended with her mother’s death. Ten-year-old Kate found her mother who had hanged herself in the manor house. In the mystery suspense novel, Storm Island: A Kate Pomeroy Mystery, written by Linda Watkins, an enthralling story unfolds. Kate continues to have seemingly inexplicable visions and needs to hide these from family members, putting her life in danger. A romance with islander Jeremy Bradshaw also has its unforeseen complications. This fictional work is truly a page turner and keeps the reader engaged from the first page to the last. The plot is skillfully crafted, as the author blends present day events with those from the past. The development of each character is fascinating to watch; it is difficult to ascertain who has good intentions or evil purposes towards Kate until the last chapters. There are many twists and turns throughout this exciting story. Author Linda Watkins has written a riveting mystery suspense story in Storm Island: A Kate Pomeroy Mystery. As the title indicates, this book is to be the first in a series of Kate Pomeroy mysteries on Storm Island – and we look forward to the next edition!